About a month ago, Hunter developed a very raw looking rash near his back legs. We took him to the vet and it was determined that he picked up a bacterial infection outdoors. Hunter loves being outside and going for walks with us. So it wouldn’t be surprising if Hunter picked up this infection during one of our hiking or park trips. Especially while he was off leash! Since then, Hunter’s had an antibiotic, an anti-fungal medication, antiseptic spray, a probiotic, an Omega-3 oil, and a medicated shampoo. Quite the cocktail of medication! We’ve had a few more vet visits in between (check-ups and a visit due to Hunter vomiting from his mix of medication). Finally, Hunter’s feeling way better and his rash is just about cleared up! After many vet visits, we’ve gotten pretty sick of going for check-ups that ultimately give the vet an excuse to try and charge us into the poorhouse. Knowing that Cairn Terriers are prone to skin issues, we’ve done some research to try and treat him holistically. There are two superfoods that I’m absolutely loving for Hunter – organic coconut oil and spirulina. I am a big fan of both of these superfoods for my own health. It turns out that they’re pretty beneficial for your pets, too! Coconut oil is great for digestion, helps to clear up infections (Hunter’s total proof of that! ), and is really great for a dog’s skin and coat. 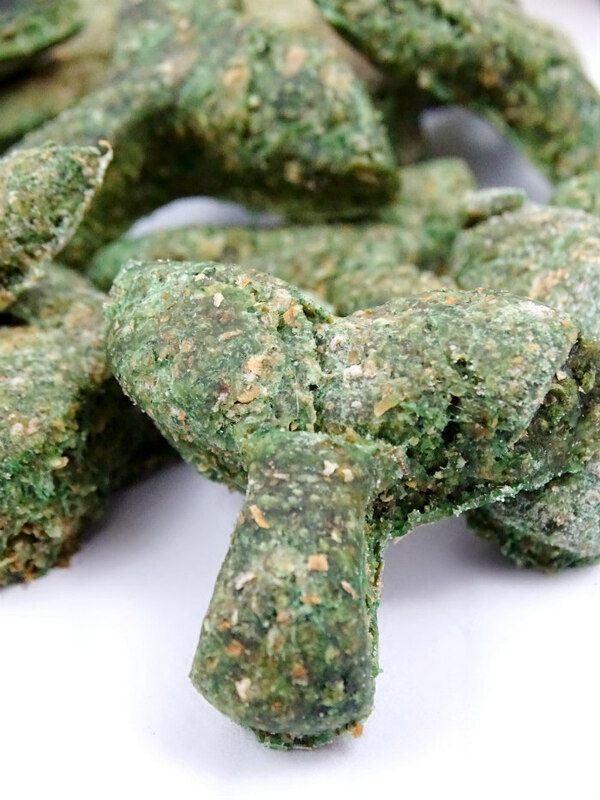 I bought spirulina powder for a kale chip recipe, but it’s full of great health benefits, too! Spirulina is super nutritional for humans and animals. But for dogs, it helps boost the immune system, helps with allergies, and is good for the skin and coat, too! It had been a while since I made any homemade dog treats. So during our major snowstorm last week, I decided to do some baking. 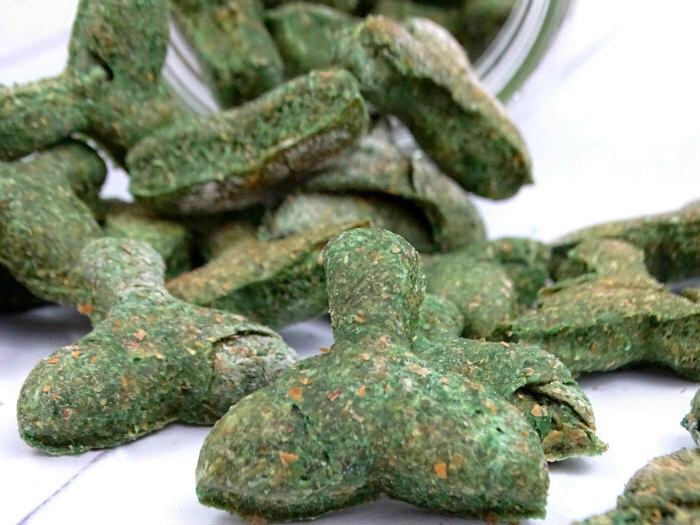 I made Hunter mermaid tail dog treats with coconut oil and spirulina. After baking these treats, it turns out that Hunter’s a big fan of the mermaid trend, too! In a large bowl, add whole wheat flour, egg, and water. Mix until dough comes together. Add spirulina powder and organic coconut oil. Continue mixing. Form dough into a ball with your hands, making sure all ingredients are incorporated evenly. If dough feels too dry, add a little more water until it's soft and easy to work with. On a lightly floured surface, cut out mermaid tails. Place evenly spaced on a cookie sheet. Bake 10-12 minutes or until treats are golden brown and crisp to the touch. 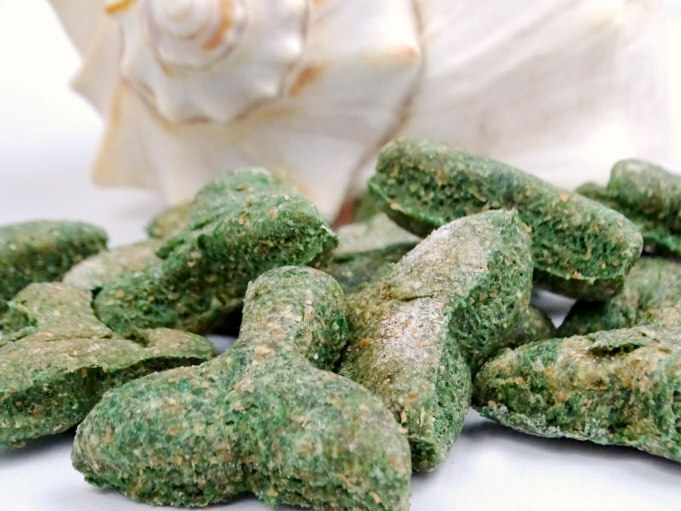 Allow mermaid tails to cool completely before treating your pup. Store treats in an airtight container. I feel your vet bill pain! Our girl was sick for almost 2 months and the vets had no answers but kept pushing the same expensive treatment on us! I’m stashing this recipe in my bag of tricks as I also prefer the holistic route. Such a great ideas supplementing these for your pets too! Glad to hear he’s feeling better! These treats are so adorable! I bet he loves them. These are so cute!!! 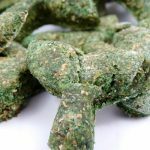 I love to make homemade dog treats for my pups!! Thanks so much, Sheena! 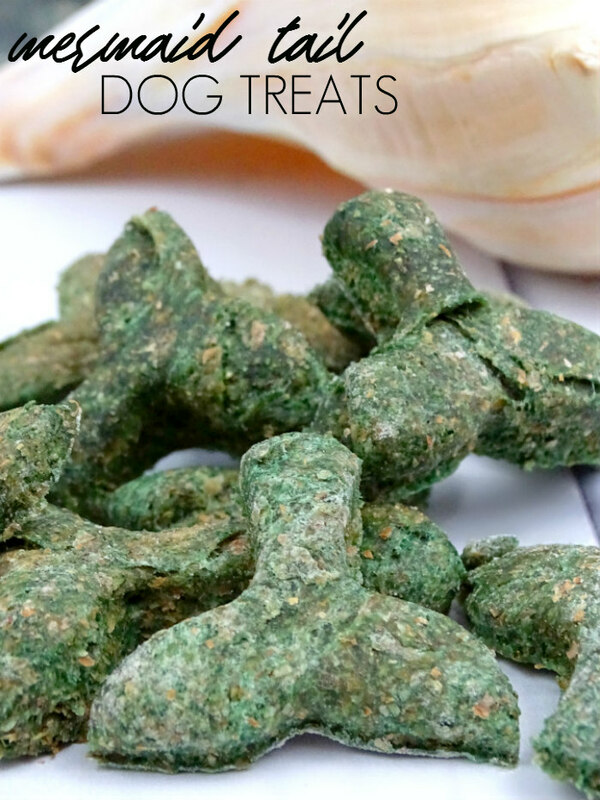 I hope your pups enjoy these homemade treats, as well!